Current tumor research relies primarily on xenografting human tumors into immunodeficient mice. However, immunodeficient mice are not sufficient to test the effectiveness of immunotherapy because they lack a human immune system. Shanghai Model Organisms has developed a series of humanized mouse models for human immune checkpoints, especially PD-1, to test drugs that target human immune cells. The ability of tumor cells to avoid immune destruction (immune escape), as well as their acquired resistance to anti-cancer drugs, constitute key barriers to the successful management of cancer. 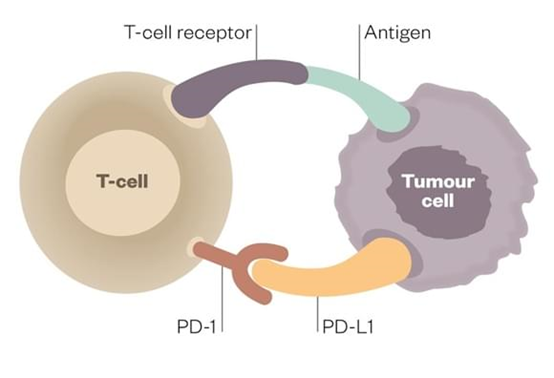 An important mechanism of cancer immune escape involves interaction between the Programmed Death 1 (PD-1) receptor on cytotoxic T lymphocytes (CTLs) with the Programmed Death Ligand 1 (PD-L1) on cancer cells or other host immune cells. With the interaction between PD-1 and PD-L1, the self-tolerance of tumor cells is improved, but the duration and amplitude of the immune response are limited. The PD-1 receptor (also known as CD279) is expressed on the surface of activated T cells and its ligand PD-L1 is usually expressed on the surface of dendritic cells or macrophages. Upon the binding of PD-L1 to PD-1, an inhibitory second signal is transmitted to reduce the production of cytokines by T cells and inhibit the proliferation of T cells. This regulatory system ensures that the immune system is activated at an appropriate time to reduce the likelihood of chronic autoimmune inflammation. Tumor cells can undergo immune escape by activating the PD-L1/PD-1 mechanism. In general, PD-L1 is overexpressed on tumor cells or on untransformed cells located in tumor microenvironments. When PD-L1 binds to PD-1 expressed on the surface of activated T cells, it induces the incompetence, depletion and apoptosis of cytotoxic T lymphocytes (CTL) and reduces their secretion of cytokines. In addition to interfering with CTL functions, the interaction of PD-1/PD-L1 increases the anti-apoptotic signals of tumor cells. At present, a variety of monoclonal antibodies have been developed for the PD-1 protein to restore the immune functions of the body. For example, Nivolumab and Pembrolizumab are anti-PD-1 antibody drugs. Both of these two drugs have achieved good therapeutic effects in the treatment of patients with advanced and severe cancers. Figure 2. 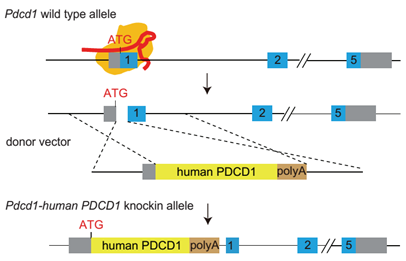 Generation strategy of humanized PD-1 mice. On the C57BL/6J genetic background, the protein coding sequences for human PDCD1 gene were inserted into the ATG position of the mouse Pdcd1 gene, so that the expression of endogenous Pdcd1 in the mouse was replaced by the expression of full length PDCD1 protein of human. Figure 3. Expression of PD-1 in the activated spleen lymphocytes of humanized PD-1 Homozygous mice is detected by FACS. Figure 4. 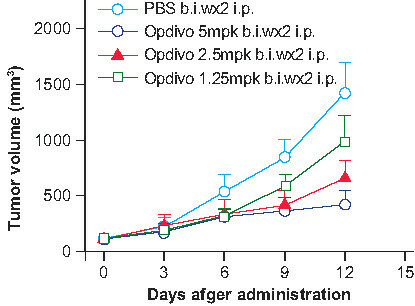 In vivo anti-tumor effect of an anti-human PD-1 antibody in a humanized mouse model of PD-1. Anti-human-PD-1 drugs significantly inhibited the growth of MC38 tumors in PD-1 mice, demonstrating that the humanized PD-1 mice can be used to assess the anti-human PD-1 antibody. A. Mean volume ± SEM of tumor tissues (completed in cooperation with Genscript). In vivo validation of anti-tumor efficacy in a MC38 tumor-bearing model of humanized PD-1 mice. Homozygous humanized PD-1 mice were inoculated with MC38 colon cancer cells. After the tumors grew to 100 mm3, the animals were randomly assigned into a control group and a treatment group (n=8). The drug was given twice a week for a total of 4 administrations. 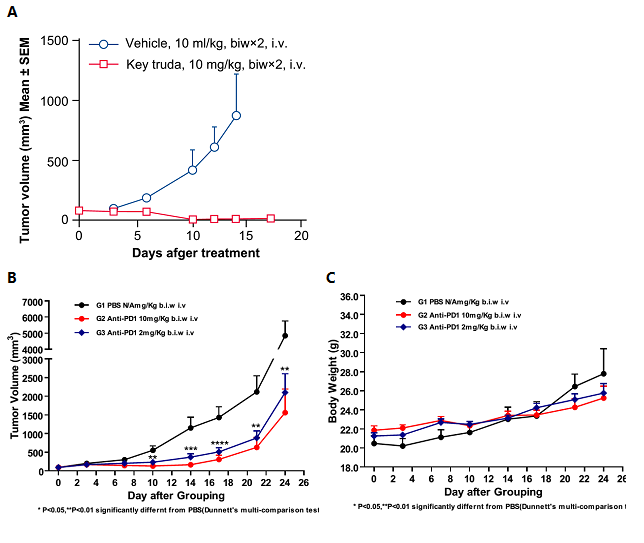 The results showed that Keytruda, a drug targeting human PD-1, exerted a very significant anti-tumor effect (p<0.001), demonstrating that the humanized PD-1 mice are a good in vivo model for validating the efficacy of antibodies targeting human PD-1. B. Mean volume ± SEM of tumor tissues. C. Mean body weight ± SEM of mice (data were obtained in cooperation with PharmaLegacy). In vivo dose validation of anti-tumor efficacy in a MC38 tumor-bearing model of humanized PD-1 mice. Homozygous humanized PD-1 mice were inoculated with MC38 colon cancer cells. After the tumors grew to about 90 mm3, the animals were randomly assigned into a control group and a treatment group (n=9). The results showed that the antibodies targeting human PD-1 showed a very significant antitumor effect (p<0.001), and such antitumor effect is dose-dependent. Figure 5. In vivo dose validation in a MC38 tumor-bearing model of humanized PD-1 mice. Homozygous humanized PD-1 mice were inoculated with MC38 colon cancer cells. After the tumors grew to 100 mm3, the animals were randomly assigned into a control group and a treatment group (n=8). The drug was given twice a week for a total of 4 administrations. 1.Black M, Barsoum IB, Truesdell P, et al. (2016) “Activation of the PD-1/PD-L1 immune checkpoint confers tumor cell chemoresistance associated with increased metastasis” Oncotarget 7(9): 10557–10567. 2.Koyama S, Akbay EA, Li YY, et al. (2016) “Adaptive resistance to therapeutic PD-1 blockade is associated with upregulation of alternative immune checkpoints.” Nat Commun 7:10501.